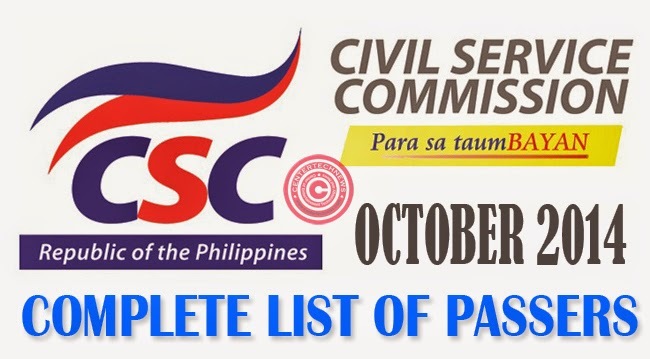 The October 26, 2014 Civil Service Exam- Paper and Pencil Test also known as Career Service Examination list of passers had been officially announce by Civil Service Commission(CSC) December 9, 2014. Other than proper requirements and other qualifications, test takers must have at least 80 percent score to be qualified for the first and second level positions in the civil service. According to CSC, 146,395 took the test for Professional Level while the rest of around 170 thousand takers took the test for Subprofessional Level. Out of 52 testing sites, Southern Luzon or Region 4 registered the largest number of combined Professional Level and Subprofessional Level examinees at 28,548. NCR came next though with a big gap with 18,074 test takers. For those who was able to get an average percentage of 80, they are required to personally present their proper documents and get their Certificates of Eligibility from their respective CSC Regional Office/Field Office. Those who failed may also get the copy of their test result through the CSC website provided that they still have their examinee number at hand. Examinee number must also be keyed in to the website to get their test result. For those taking the Subprofessional Level, they are given 2 and a half hours to answer the same test coverage only clerical reasoning, functions and procedures will be included instead of analogy and logic. Civil Service Exam- Paper and Pencil Test is conducted two to three times a year, thus those interested to take the test must always check the CSC website for test schedule registrations. The test is created to measure the capability of an individual to serve in the government.